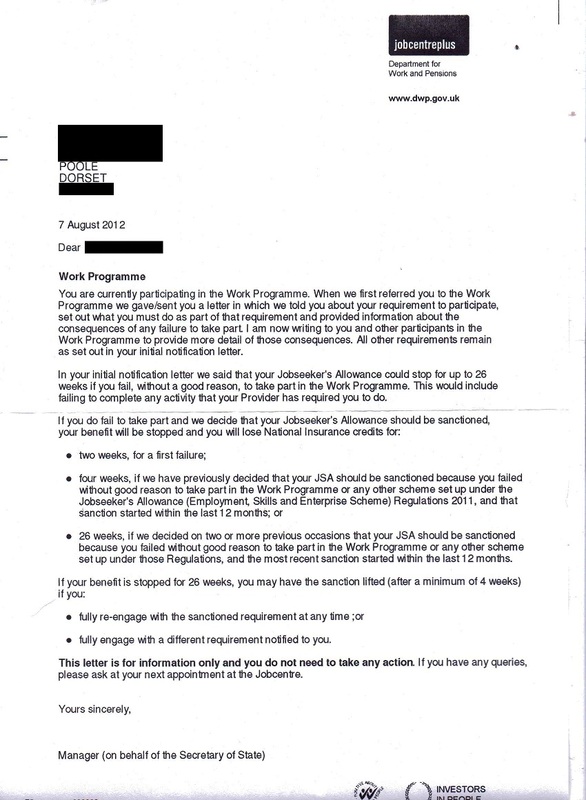 Shown below is a letter being sent out by the DWP to people participating in The Work Programme and outlines the consequences if stipulated requirements are not met – benefit sanctions. Following adverse publicity earlier in the year, the government have continuously stressed that unpaid work placements were “voluntary”. Many of those on The Work Programme and similar schemes will beg to differ. More often than not people are informed if they do not participate in “workfare” activities, their benefits will be sanctioned. Even when this is not the case, the amount of coercion, intimidation and pressure to force people to participate is immense. The phrase used in the letter, “this would include failing to complete any activity that your Provider has required you to do” seems to imply that anyone told to ‘participate’ in an unpaid work placement will face sanctions. Is it a coincidence that this letter is dated 7th August, a day after a High Court ruled that government back-to-work schemes were lawful. Everyone must realise NOW that workfare schemes will not only have implications for those currently on them. This is not “cheap labour”, it is “free labour” (slave labour if you like) and it is inevitable that the unscrupulous will exploit these schemes and use people out of work as a commodity and make a profit out of their misfortune. It will drive down wages and people on unpaid placements will replace paid employees. Those on the schemes now and those likely to be sent in the future should be empowered to resist and everyone should oppose all workfare schemes. 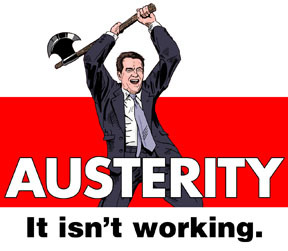 Forcing people to work for nothing will not solve the unemployment crisis. 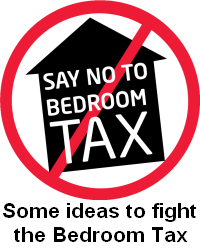 The people who are already suffering from the effects of the savage austerity measures will, yet again, be targeted while those that created the economic mess, walk bold as brass unscathed. You are currently participating in the Work Programme. When we first referred you to the Work Programme we gave/sent you a letter in which we told you about your requirement to participate, set out what you must do as part of that requirement and provided information about the consequences of any failure to take part. I am now writing to you and other participants in the Work Programme to provide more detail of those consequences. All other requirements remain as set out in your initial notification letter. In your initial notification letter we said that your Jobseeker’s Allowance could stop for up to 26 weeks if you fail, without a good reason, to take part in the Work Programme. This would include failing to complete any activity that your Provider has required you to do. • 26 weeks, if we decided on two or more previous occasions that your JSA should be sanctioned because you failed without good reason to take part in the Work Programme or any other scheme set up under those Regulations, and the most recent sanction started within the last 12 months. • fully engage with a different requirement notified to you. This letter is for information only and you do not need to take any action. If you have any queries, please ask at your next appointment at the Jobcentre.